You can view article events for all articles in the History view. That is, events for actions taken by agents on articles. 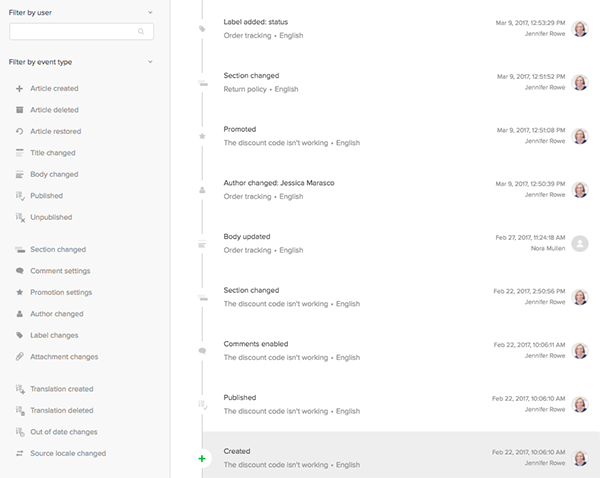 The History view does not include events for actions by end-users or actions taken on categories and sections, themes, moderation, or settings. You can also view events for a specific article, if you want to see the history of events for that article only. In History view, you can view all events or you can filter by user or event type. You can apply as many filters as needed. You cannot specify a date range for events. You must be a Guide Manager to view article events the History view. To view the previous versions and revisions for a specific article, see Viewing article revisions and restoring a previous version. In History view, you can see a complete list of all article events in your knowledge base and you can filter the list by specific event types and users. In Guide, click the Manage articles ( ) icon in the sidebar, then click the History tab. Note: If you were an existing customer on February 15th, 2017, the History view shows events beginning February 15th, 2017. If you became a customer after that date, the History view shows events beginning on the date you enabled Guide. Review the list of knowledge base article events. Apply filters as needed to view events by specific users or specific types of events. Enter a user name to see events by that user. To remove the user filter, hover your mouse over the user name, then click the X beside the user name. Click one of more article events to see those specific events only. To remove the event filters, deselect each event. Click one of more article events to see specific events. To see the edits made to the title and body, along with previous versions of the article, see Viewing article revisions and restoring a previous version. Navigate to the article you want to review, then click Edit article in the top menu bar. (Guide Enterprise only) Click Article settings. Click Article history in the article sidebar. View the history of changes for that article in the History view. 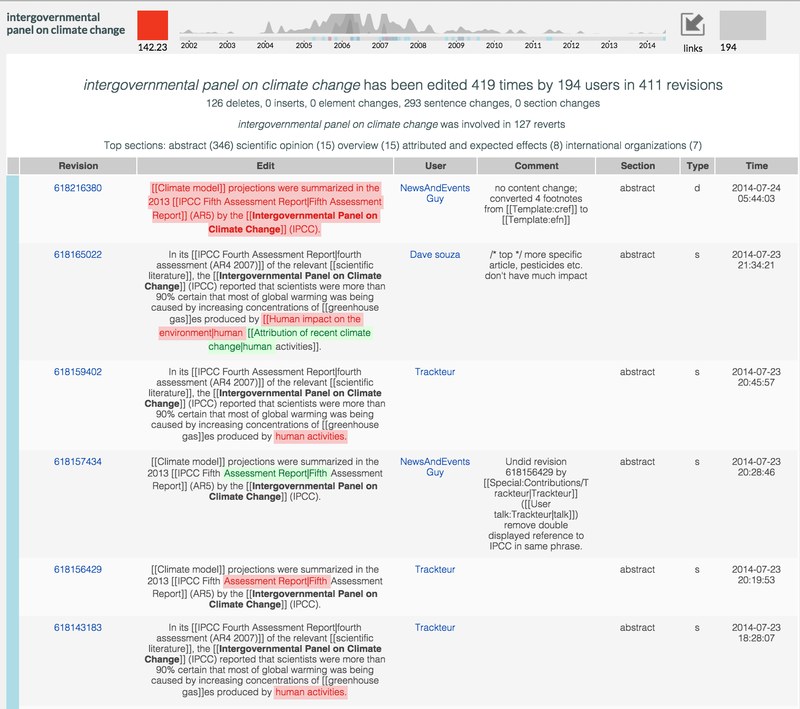 Notice that the History view is filtered so that changes are scoped to the selected article. You can click any body update or title update to see that specific edits that were made during that update. I don't see the "History" tab. (Yes, I'm admin). Not yet implemented in the Dutch version maybe? Thanks for the feedback! We've been rolling out slowly with the feature. I think if you check back today it should be live for your account. Created a new test trial: after clicking "history" I'm getting infinitive redirect loop i the browser. I'm going to get you into a ticket so we can troubleshoot this a bit further with you. I will see you there soon! Is there a way to see what exactly changed in the article? For example, I see the "Body" was updated in an article. I would like to see what exactly was changed. Where can I find this? Also interested if there's a way to view what the actual change was. A side by side view of different versions and the differences between them would be especially excellent. We are working on this right now. Currently the history will just show that the article body has changed and doesn't render the changes. We are working on an additional feature that will show this information that will work together with the new history view. We are currently working on this and determining a timeline to get to beta now but I don't have an exact timeframe just yet. I have the tab for the history view but no history. I was a user long before Feb. 2017. I would recommend reaching out with our Customer Advocacy team via support@zendesk.com or via chat. We should be able to resolve this issue for your account. Could someone tell me what the 'Out of date changes' filter should do? Is it meant to show articles where the source locale translation has been updated, but the translations haven't? I'm not 100% sure on that, actually, so I'm going to see if I can find a Guide expert to help you out here. Stand by! This will filter for events where someone flags a translation. The wording is not clear, I'll talk to the team about getting that updated. Thanks! Got it. Thanks Ryan and Jessie. Is it possible to add the Ticket number in the Create event on the article Details page next to the Created action? This would be a great enhancement for our team. Agents are asking for a link back to the ticket from which the article is created. This would easily solve the problem for them. At this time, those details are not passed to the events dataset for publication in the history. However, that is a very good feedback idea! If you would, please think about posting in our Product Feedback forum, https://support.zendesk.com/hc/en-us/community/topics/200132066-Product-feedback. We have a team that regularly goes through that section looking for popular ideas on how we can develop our platform. The more votes on a post, the more likely our team will raise it to the appropriate dev/product team.